of venous leg ulcers and important techniques to help heal them. Millions of men and women suffer with venous leg ulcers. These are chronic wounds that heal slowly and recur easily. Fortunately, healing rates can be high and recurrence rates low, especially if patients understand and participate in their daily self-care plan. In this award-winning video, colorful graphics, interesting diagnostic tests and live demonstrations help patients and staff understand the cause and treatment of venous leg ulcers. We follow one individual as he learns how to care for his wound, including daily leg compression, leg elevation and calf pump exercise. Youll use this unique video in hospital wound clinics, staff education, dermatology, vascular surgery, PT, home health and long-term care. Each DVD purchase includes a 6-page patient handout. An excellent program. I use it for physical therapy staff training and patient education. Endorsed by Professor Christine Moffatt, PhD MA RGN DN. Professor of Nursing, Thames Valley University, London, and a Director of the Centre for Research and Implementation of Clinical Practice. FROM A LEG ULCER PATIENT: I have had ulcers on my legs for the past 15 years. The doctor gave me a video put out by Family Health Media. I didn't know much about leg ulcers, only that they were very painful and are miserable to heal. This video is so wonderful and has been so helpful and informative. I have never seen anything like it. I didn't realize I will have to deal with them the rest of my life. I didn't know why compression is so important in the bandages or socks, why elevating the leg and walking are also important. 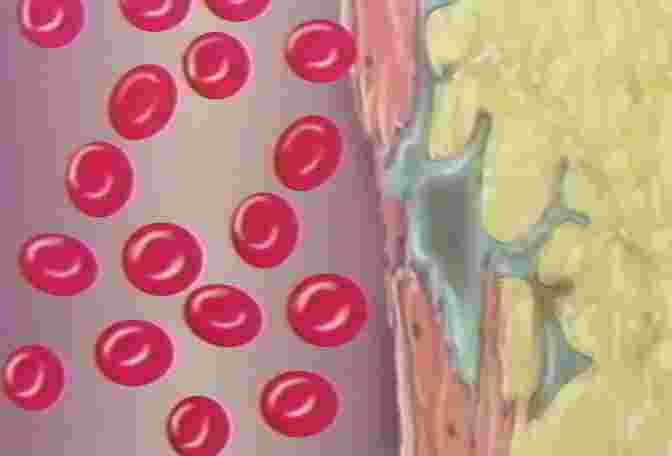 The video explains perfectly about the veins and arteries and how the ulcer develops. I don't know how to thank you enough for putting this video together. I wish that everyone who has this problem could see it. This video has a comprehensive explanation of the prevention and health care issues surrounding venous leg ulcers. I feel it would be an excellent video to consolidate the training addressing compression bandaging as well as hosiery. Sister Kate Bennett, District Nursing Sister, Eastbourne, United Kingdom. The positive and empowering message at the core of this programme makes it a particularly attractive and useful video. The nature of chronic venous insufficiency is explained beautifully. Costing US$99.00 and available in a variety of formats (PAL/VHS) it represents excellent value for the money. Review excerpt, Journal of Advanced Nursing, November 2000. The Venous Leg Ulcer video would benefit carers and patients suffering with these types of wounds. Lynfa M Edwards, Senior Lecturer/Practitioner; Centre for Research and Implementation of Clinical Practice; Wolfsan Institute of Health Sciences; Thames Valley University; London, United Kingdom. As a nurse educator, I would recommend Venous Leg Ulcers as a part of a comprehensive patient and family education program. The tone of the video is optimistic, focusing on simple explanations and realistic life style changes that would enhance venous blood flow. Simple terms and excellent diagrams are used to clearly describe what venous leg ulcers are and causative factors. Insight into realistic patient concerns, such as slow healing, are considered through patient documentaries. Review excerpt, Orthopaedic Nursing. September/October 2000  Vol. 19, No. 5. This video helps to fill a void in patient education materials about wounds and their care. 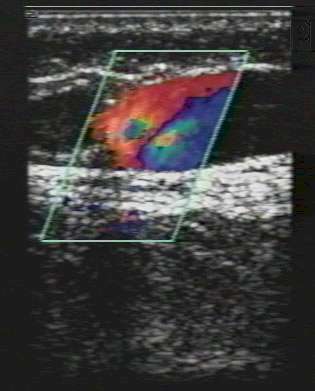 It has some unique features, such as showing the physiologic effect of the calf muscle pump, normal and diseased valves in a Doppler study, how a diseased valve looks and the effect of compression altering the shape of the vein. These action images are generally not available or do not have the same impact in print form. It mentions that there are several types of compression dressings; it does not endorse one particular product. The patient is shown as active participant. The health care professionals shown are not designated as nurse, physician assistant or physician, so the video is appropriate to many clinical settings. In summary, this video is a nice patient teaching program that will augment a professional’s resources about venous disease. It provides an excellent foundation for patient learning. It should be considered for purchase ($99) by professionals who provide chronic venous insufficiency preventive care and venous ulcer care. Review excerpts, The Journal of Wound, Ostomy and Continence Nursing; March 2001 (Vol. 28, No. 2). Recently I viewed the video, Venous Leg Ulcers. It is excellent. The pictures are outstanding. It is a must for staff development. Ruth Shockley, RN, Staff Development; Berlin Nursing and Rehab Center / Berlin, MD. 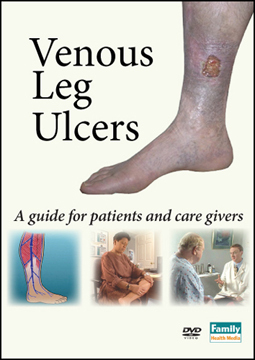 Venous Leg Ulcers is an excellent tape for patient and family education. Sharon Calandrino, Physical Therapy Assistant; University of Louisville Burn Unit / Rehab Dept. / Louisville, Kentucky. 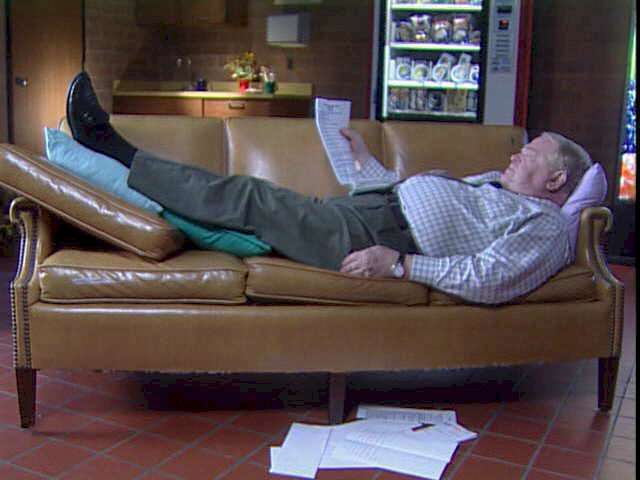 The first step in helping patients cope with chronic venous insufficiency is education, and this 21-minute video is an excellent beginning. Information about the etiology and treatment of venous hypertension is presented in both a positive and non-threatening manner. While most educational videos dealing with this subject focus on wound care, few place emphasis on the importance of behavior modification in achieving good clinical outcomes. The message this video conveys to the viewer not only makes it a valuable teaching tool for patients and family members, but also for clinical staff. Review excerpt, Dermatology Nursing, Vol. 12 No. 5; 2000 . This video provides comprehensive patient education (about venous leg ulcers). Compliance with preventive treatment is emphasized. as reviewed in Home Health Care Management & Practice, June 2000. This video is excellent - the best I've seen on venous disorders. This is an essential educational video for health-care professionals and students as it provides them with crucial health promotional information to share with clients and colleagues. The information is presented in a clear and logically progressive format ... and is iterated in a variety of modes. The progression of a ‘typical’ case scenario throughout the video serves to both reinforce and familiarize the information. Many of the questions often voiced about venous leg ulcers and some of the misconceptions surrounding the origin of ulcers are considered. The emphasis on client empowerment and responsibility represents an important shift of focus away from direct medical intervention per se. It also supports research findings that emphasize the significant influence client education has on the healing and prevention of recurrence of venous leg ulceration. Obviously, medical/nursing intervention is discussed and the importance of comprehensive assessment and appropriate compression therapy is stressed. The need to provide medical/nursing support to the client is also inferred. This information, however, is well balanced within the context of client responsibilities and the importance of daily self-care measures. Review excerpts, Australian Journal of Rural Health, August 2000. Award-winner! 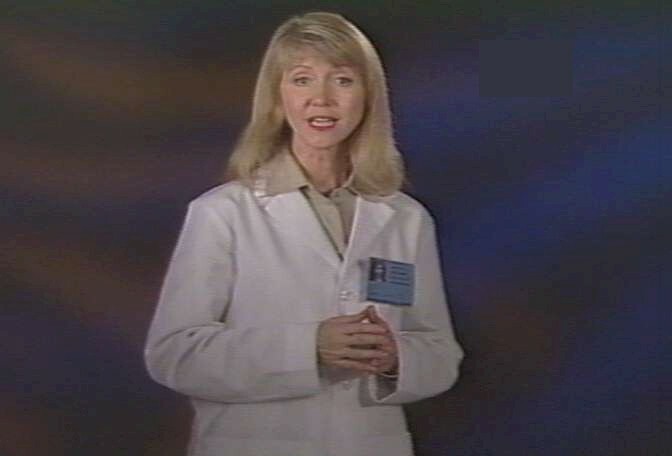 The 2000 Videographer Awards, Award of Distinction; Medical / Patient Education. Women and men with venous leg ulcers or chronic venous insufficiency. Family members. Staff education and inservice. Hospital wound clinics. Dermatology. Vascular surgery. Vascular nurses. Enterostomal therapy nurses. Physical therapy. Schools of nursing. Home health. Long term care settings. Hospital discharge planning. In-house TV channel. Family practice settings. Podiatry. Family caregivers. Study Guide and illustrated 6-page viewer handout. Family Health Media gratefully acknowledges the following experts for their assistance in developing this program. This content outline is provided for informational purposes only. Always consult a qualified health care professional before undergoing any medical treatment. All images © Family Health Media Duplication prohibited. As the program opens we meet John, a high school teacher who has a venous leg ulcer. John had suffered for years with his leg ulcer, but it is finally healing now because he has learned from his health care professional how to take care of it. We see John wearing a special compression bandage, called an Unna boot. We see him elevating his legs. And we see him walking. 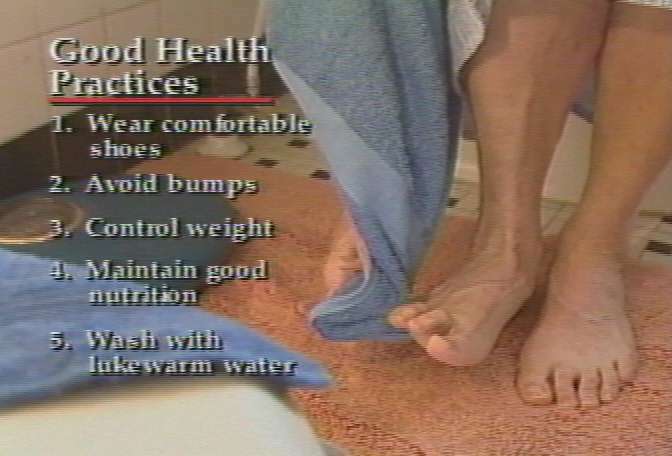 John has learned from his health care professional that these simple techniques must be done every day so that his leg ulcer will keep getting better and not come back again. Next, the hostess for the program shows us several examples of actual venous leg ulcers. She explains that they usually occur on the inside of the lower leg, often near the ankle. Venous leg ulcers happen to millions of men and women of all ages from all walks of life. We learn that as many as one in four people may have a blood flow problem in their lower legs and could benefit from this information, too. We see pictures of arterial ulcers and diabetic foot ulcers and learn that these types of wounds are treated differently and are not covered in this program. Now we learn about the difficult job the heart has in pumping blood up from the lower legs. Without help, high pressure can build up inside the leg veins. Animated graphics show how the calf pump helps to push blood up and out of the leg to keep pressure at a safe level. Next we look inside the leg vein to observe how a one-way valve prevents blood from going the wrong direction. We learn that constant high pressure pushing out against the delicate vein walls can stretch the veins out of shape. When that happens the one-way valves do not close well, so blood can go backwards and high pressure can build up. It's called chronic venous insufficiency, or chronic ambulatory venous hypertension. We learn that high pressure and damaged veins and valves can happen for many reasons. Often it's a blood clot, called deep vein thrombosis, that causes the damage to the valves and veins. 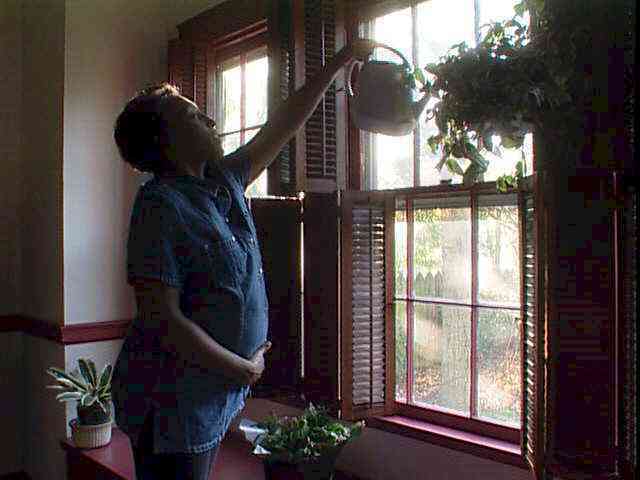 People who have to stand or sit a lot every day in their job are at higher risk.. Pregnancy can be a factor, too. The hostess explains that many times, the first sign of high venous pressure in the legs is persistent swelling near the ankles, usually at the end of the day. This is called edema. Varicose veins are a visible sign of increased pressure and damaged veins. Standing may cause a dull aching pain that goes away when the legs are raised. Next we see how a venous leg ulcer can get started. With the veins stretched thin from chronic high pressure, we see that blood and fluid can escape through the vein out into the tissue. We watch as the escaped blood turns the skin a brownish color, and makes the leg swell with edema. The hostess explains that the skin is weak and vulnerable now, and just a small bump or scrape could snowball into a serious venous leg ulcer. We return to John, the high school teacher from the opening of the program. 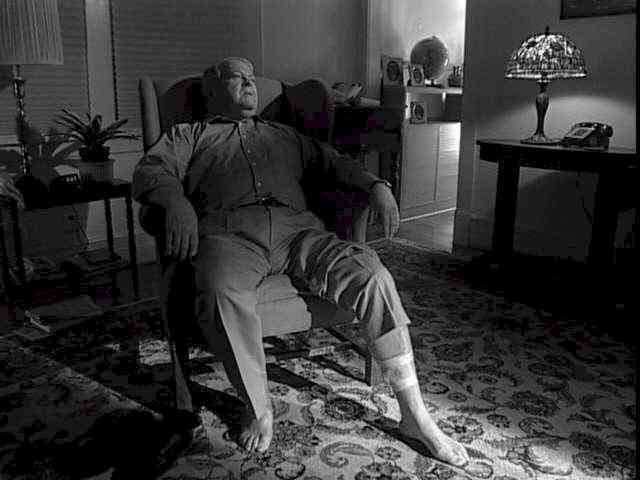 We flash back in time to see John before he had learned how to take care of his leg ulcer. We learn that John had suffered with the leg ulcer for years. He had tried lots of home remedies to make it get better. Sometimes the wound would improve, but it always came back. John was very unhappy. 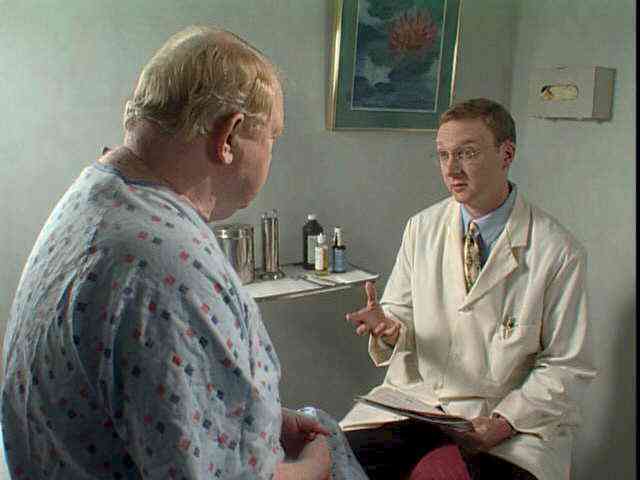 Finally, we observe John as he gets some good news from his health care professional. He learns that under a health care professionals guidance, daily self-care by the patient can help heal most venous leg ulcers and keep many from coming back. Often this includes daily leg compression, elevation of the leg above the heart and some simple calf pump exercises. We learn that some patients receive a special diagnostic test called "duplex ultrasound." This painless procedure can provide valuable information about the extent and location of damage. We hear and see the results of actual duplex ultrasound tests performed on healthy leg veins and damaged leg veins. Now, we observe John's health care professional as he cleans, inspects and measures John's wound. Next, John's health care professional applies a layered compression bandage to the wound, starting with a special dressing placed directly against the wound. This is followed by a paste bandage which is wrapped around the leg from the foot up to the calf. Finally, he wraps on a compression bandage. We learn that this type of bandage is very common, but that there are other types of compression bandages from which the health care professional can choose. At this point the program turns to a description of three self-care activities that are often recommend by health care professionals for their patients with venous leg ulcers or chronic venous insufficiency. We learn that as many as one in four adults may have a blood flow problem in their legs, the early warning signs of which may be pain, swelling or varicose veins. The hostess reminds viewers that anyone with symptoms like these should see a doctor. Such individuals, under the supervision of their health care professional, also may benefit from the self care activities. The first activity is daily leg compression. We observe individuals using layered compression bandages and compression stockings. We learn that daily leg compression, whether it's from bandages, mechanical pumps or doctor-approved stockings, is essential for wound healing and the prevention of recurrences. Graphics demonstrate the positive effect compression has upon damaged leg veins. The second daily activity is walking and other simple calf pump exercises. We are reminded that the calf pump helps push blood out of the legs. This helps to keep pressure in the leg veins at a safer level. We observe individuals who are unable to take walks as they demonstrate simple calf pump exercises while seated. The third daily activity is elevating the legs above the heart. The hostess performs a simple demonstration to show how elevation helps to drain blood out of veins. Finally, the hostess lists six health care practices to help keep legs in good condition, such as wearing comfortable, low-cut shoes and washing legs in mild soap and lukewarm water. The program concludes with a reminder from the hostess that anyone who has a leg ulcer or anyone who thinks they might have a blood flow problem in their legs should talk to a health care professional to find the cause and best treatment.